Here are some facts about Horatio Nelson. 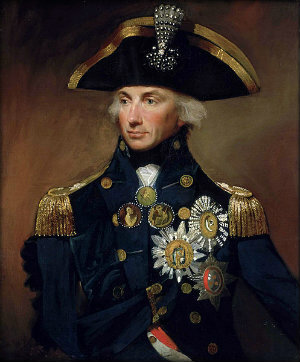 Horatio Nelson was a British naval officer who fought in the Napoleonic wars. He was born in Norfolk, England in 1758 and died in 1805. Nelson was one of 11 children and joined the navy at age 12, becoming a captain when he was 20 years old. He was made vice admiral and was very successful in this role. Nelson was well-travelled; he fought in battles in the Caribbean, Denmark and Egypt. He also sailed close to the North Pole and may have chased a polar bear on the voyage. Despite being a great sailor, Horatio Nelson suffered from seasickness all his life. He also lost an arm and an eye during his career, and almost lost his other eye. Horatio Nelson often disobeyed instructions. On one occasion, he ignored orders to withdraw, used his bad eye to look through the telescope and claimed he couldn’t see the signal to withdraw. One of Nelson’s greatest victories was at the Battle of the Nile in 1798. He tricked the French ships by sailing between the fleet and the shore and attacking them. Horatio Nelson was killed at the Battle of Trafalgar in 1805. He was shot by a French sniper and must have been easy to recognize as he wore his full uniform and all his medals. In England, dozens of pubs are named after Nelson, as well as streets in several cities. One of London’s most famous monuments, Nelson’s Column in Trafalgar Square, commemorates his life and achievements. Nelson’s Column in Trafalgar Square was built in 1840 and is 52 metres tall. The bronze panels around the base are from captured French guns and depict Nelson’s most famous battles. Nelson’s flagship, the HMS Victory is today docked at the naval dockyard in Portsmouth in the world’s oldest dry dock. About 350,000 people visit the Victory every year. Really really helpful with history homework thanks!! !